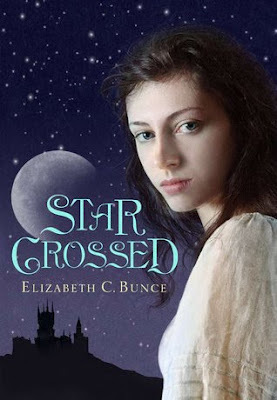 Here is the very nice cover art for Elizabeth C. Bunce's upcoming sophomore novel--Star Crossed. I got all jumpy when I saw it as I have been really looking forward to this release ever since I went absolutely wild over Bunce's A Curse Dark as Gold. The writing was so stunning, and the reworking of the Rumpelstiltskin fairy tale so surprising and pitch-perfect that I vowed to read whatever the woman wrote. Star Crossed features a thief/spy named Digger, a land where magic has been banned, and a rebellion in the works. I simply cannot wait. Star Crossed is due out October 1st. Interesting, I've never heard of either of these books! I'll have to add them to my TBR pile! If you have given your vow then I do believe this is an author worth checking out :) Nice cover and I just loved the title! Thanks - I liked Curse and this looks fabulous. I still need to read A Curse Dark as Gold. Have had it my pile forever! Mollie, CURSE is lovely and absorbing. I highly recommend it. Ladybug, definitely try CURSE. Just a heady debut, IMO. brizmus, I think so too. Oh, this so seems up my alley! (Oddly, Amazon has up a different cover. This one is better, I think, and I'm basing that mostly on the font, which I love.) I should probably read CURSE, too - I've heard so many good things about it. Such a pretty cover! Plus I'm always curious about books that have a thief/spy protagonist, probably because of Gen from the Queen's Thief series. I didn't know she had a new book coming out! hooray! Janssen, lovely news isn't it? Thanks so much for posting this, I didn't know that she had another book coming out. I absolutely LOVED Curse and I've been dying to read more by Bunce. I love rereading my comments to find out how confusing they are! :P I do hope the cover is the one you posted. And...off to get CURSE! Vanessa, I was thinking of you. It's so exciting! Chelle, lol. I can't wait to hear what you think of it. Fantasy novel + female hero who's also a spy/thief + rebellion = WIN. I'll have to go read Bunce's first book now.